I love a good story. Who doesn't? If anything, the success of the entertainment world, and even news, shows that everyone loves a good story. Stories are great because they help share an idea, a vision, a lesson, and on and on. Stories provide not just facts, but context and emotion - this is what makes them memorable. Furthermore, stories are not just used to entertain - they can be used to persuade. This is exactly how businesses use stories. The great ones don't just give facts, they share stories: Stories about how they were founded, why they exist, how they created such an excellent product. They also share stories of customers: how they use the product, how their lives are better as a result of the product. Of course, as an entrepreneur I want to know if the art of telling a story can be learned. I've gone as far as looking into creative writing classes, but nothing had really peaked my interest yet. Then I read Tell to Win by Peter Guber, which came out in March. Guber talks about the power of telling stories; how telling purposeful stories can help you win in whatever your endeavorer is. His main thesis is that learning to tell a good story (where "good" = getting the desired outcome) can be learned. Furthermore, Guber says that we all have the ability to tell stories hard-wired into our DNA - we love to share stories. So Guber helps people refine the art of telling stories, and gain the confidence to use story telling regularly. 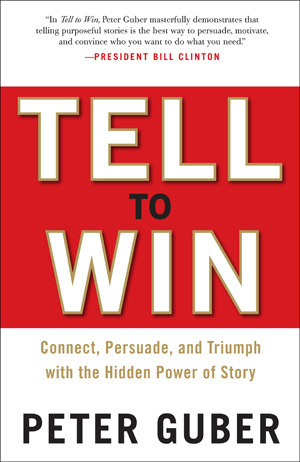 Not surprisingly, Tell to Win is full of fun stories that Guber uses to make his points. They are all entertaining, and make their point well. Keith Ferrazzi, author of Never Eat Alone (which I also reviewed) did an interview with Guber which you can watch to get a feel for what you'll learn in his book. I enjoyed reading this book and will definitely book looking for ways to incorporate it into my life. For example, as an analyst, it'll be helpful to not just show data, but share stories behind the data. Oh yeah, I also couldn't help but notice that Jesus often used stories when making a point. Clearly there is something powerful about stories if the creator of the universe used this technique.